Gartner has recognized Progress in the 2018 Gartner Magic Quadrant as a Challenger for web content management. This is the fifth year in a row that Progress has been included in the yearly report. Web content management has become the most vibrant and growing market and is also fueled by digital marketing strategist for continuous innovation. Today, IT leaders, merchandisers, publishers and marketers all view the web content management as something critical for business. It has in fact become the backbone for creating engaging customer experiences and it is only through a rich CMS that users can easily create, preview, publish and edit a great web content. According to Gartner, the WCM has become the process to control the content that is consumed over various digital channels through the use of specific management solutions, which may be procured as an open source tool, cloud service, hosted service or commercial products. With the world of digital experience evolving, Web content management plays a great role in the advancement of digital solutions and Progress Sitefinity is a great CMS platform that is part of the multi-dimensional digital solutions that allows the organization to deliver omni-channel customer experience by integrating both mobile and web. It has allowed the marketers to optimize the customer experience and offered developers greater flexibility to build personalized experience across varied channels. Integration with adjacent technologies like digital asset management, customer relationship management and analytics. The web presence of your organization is through your website and it is where you keep your customers, prospects engaged. To do this, it is vital that your WCM empowers you to deliver compelling content across every channel and Sitefinity CMS offers an integrated approach that offers solutions from content management, campaign management to lead generation and helps to take your website to the next level. 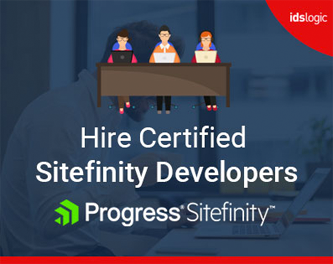 With Sitefinity CMS, you can now create dynamic campaign sites and also micro sites for promoting new products, upcoming events and special promos. With the increased growth of social media like Twitter and Facebook, you will have to extend your online strategy that is beyond your site to reach fresh customers. Sitefinity offers tools that help to engage with your community, receive feedback and share ideas and meet customer expectations. The integrated analytics module of Sitefinity combines the power of Google Analytics with the easy to use interface of Sitefinity development. With these tools a deeper insight of the traffic usage information and visitor’s behavior can be tracked. The SEO tools in Sitefinity ensure that you are easily discovered by the search engine and edit the tiles, descriptions and keywords to improve SEO of your site. The CMS helps you to quickly create landing pages based on the target keywords. Sitefinity CMS development helps to maintain multilingual content and the web visitors can view the site in their language of choice. The language synchronization service also helps to apply any layout changes from the default language version. Using Sitefinity interface from any browser you can easily access and manage your website. The management interface can be localized according to your choice of language. The permission structure and content workflow is possible by only the authorized users.